What are the standard dimensions of kitchen sink? Actual dimensions will depend on a type of a kitchen sink and exact measurements will be determined by the shape and style. There are no strict standards and every manufacturer will offer its own sink specifications, but typically the sizes will be made accordingly to standards of base kitchen cabinets dimensions. 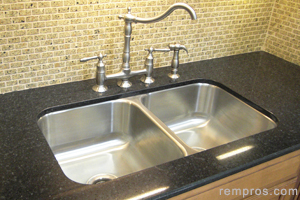 Undermount 16 – 20 gauge stainless steel kitchen sink is one of the most popular options for any type of stone countertop. Single 7” deep bowl 15 inches wide and 18 1/2 inches from front to back with 13 1/4” x 16 3/4” actual rounded cutout dimensions will require 15” minimum base cabinet which typically used for smaller kitchens. One of the biggest 3 bowls sink with 10 3/4” x 13” small bowl in the middle for 48” wide cabinet will have a size 46 1/2” x 20 1/2”. Typically two 7 – 9 inches deep equal bowls sink will be 1/2 of an inch smaller than standard kitchen cabinets width usually 30, 33, 36 or 42 inches. Distance from the front to back cannot exceed 20 1/2” because of interior space of the cabinet, but might vary from 18 to 20 1/2 inches. 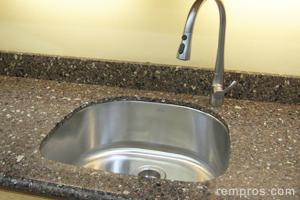 Diameter of rounded sinks is usually 21 inches or smaller. Not all undermount sinks proportionally equal. While one bowl can be 17 3/4” x 18 1/2” 9 inches deep, second might be 10 1/2” x 16” x 7”. Specifications will be different for zero radius beveled rim kitchen sinks. Actual cutout will be 1” – 1 1/4” smaller than total overall width and length of the undermount sink from each side and nearly flush-mounted, which means the bowl is even with the countertop. Mounting the sink from underneath will require 1 - 2 inches allowance inside the kitchen cabinet from all sides and that is the main factor in determination of maximum kitchen sink dimensions. Drop – in sinks will have similar bowls measurements as undermount, but actual overall size might be bigger due to less limitation by the kitchen cabinets. Overmount sink might go up to the backsplash from the back and about 2” from the front edge of countertop making a total size of 21 – 22 inches. Holes for the faucet often made directly in the drop – in sink. Any type of a sink typically will have a 3 1/2” in diameter drain hole in the center of the bowl or placed a few inches from the back side of a bowl. Corner orientation sink might have two equal 14 x 15 3/4 x 8” 90° oriented bowls with a faucet in between or one bowl might be smaller than other. For smaller kitchen or bar like right triangle single bowl 14 x 14 x 6.5 inches sink is a good option. Unlike USA most of countries use metric system. In Europe sink sizes typically measured in millimeters while UK still uses both – imperial and metric units. Single bowl undermount sink might be 430 mm. W x 420 mm. D x 230 mm. H (W – width from side to side, D – depth from front to back, H – height from top to bottom of a sink in millimeters ) with 90 mm. diameter of drain hole. While depth usually stays within 60 – 80 mm. range because of base kitchen cabinets limitation; width might vary significantly. 2.5 bowl kitchen sink might have actual dimensions 1000 x 500 x 170 millimeters. But still exact measurements will range for any type of a kitchen sink.